This is the fifth post in a series of posts on how to build a Data Science Portfolio. You can find links to the other individual posts in this series at the bottom of the post. If you’ve ever worked on a personal data science project, you’ve probably spent a lot of time browsing the internet looking for interesting data sets to analyze. It can be fun to sift through dozens of data sets to find the perfect one, but it can also be frustrating to download and import several csv files, only to realize that the data isn’t that interesting after all. Luckily, there are online repositories that curate data sets and (mostly) remove the uninteresting ones. In this post, we’ll walk through several types of data science projects, including data visualization projects, data cleaning projects, and machine learning projects, and identify good places to find data sets for each. Whether you want to strengthen your data science portfolio by showing that you can visualize data well, or you have a spare few hours and want to practice your machine learning skills, we’ve got you covered. It shouldn’t be messy, because you don’t want to spend a lot of time cleaning data. It should be nuanced and interesting enough to make charts about. Ideally, each column should be well-explained, so the visualization is accurate. The data set shouldn’t have too many rows or columns, so it’s easy to work with. A good place to find good data sets for data visualization projects are news sites that release their data publicly. They typically clean the data for you, and also already have charts they’ve made that you can replicate or improve. FiveThirtyEight is an incredibly popular interactive news and sports site started by Nate Silver. They write interesting data-driven articles, like “Don’t blame a skills gap for lack of hiring in manufacturing” and “2016 NFL Predictions”. FiveThirtyEight makes the data sets used in its articles available online on Github. Airline Safety — contains information on accidents from each airline. US Weather History — historical weather data for the US. Study Drugs — data on who’s taking Adderall in the US. BuzzFeed started as a purveyor of low-quality articles, but has since evolved and now writes some investigative pieces, like “The court that rules the world” and “The short life of Deonte Hoard”. BuzzFeed makes the data sets used in its articles available on Github. Federal Surveillance Planes — contains data on planes used for domestic surveillance. Zika Virus — data about the geography of the Zika virus outbreak. Firearm background checks — data on background checks of people attempting to buy firearms. Socrata OpenData is a portal that contains multiple clean data sets that can be explored in the browser or downloaded to visualize. A significant portion of the data is from US government sources, and many are outdated. You can explore and download data from OpenData without registering. You can also use visualization and exploration tools to explore the data in the browser. White House staff salaries — data on what each White House staffer made in 2010. Radiation Analysis — data on what milk products in what locations in the US were radioactive. Workplace fatalities by US state — the number of workplace deaths across the US. The cleaner the data, the better — cleaning a large data set can be very time consuming. The data set should be interesting. A good place to find large public data sets are cloud hosting providers like Amazon and Google. They have an incentive to host the data sets, because they make you analyze them using their infrastructure (and pay them). Amazon makes large data sets available on its Amazon Web Services platform. You can download the data and work with it on your own computer, or analyze the data in the cloud using EC2 and Hadoop via EMR. You can read more about how the program works here. Amazon has a page that lists all of the data sets for you to browse. You’ll need an AWS account, although Amazon gives you a free access tier for new accounts that will enable you to explore the data without being charged. Lists of n-grams from Google Books — common words and groups of words from a huge set of books. Common Crawl Corpus — data from a crawl of over 5 billion web pages. Landsat images — moderate resolution satellite images of the surface of the Earth. Much like Amazon, Google also has a cloud hosting service, called Google Cloud Platform. With GCP, you can use a tool called BigQuery to explore large data sets. Google lists all of the data sets on a page. You’ll need to sign up for a GCP account, but the first 1TB of queries you make are free. USA Names — contains all Social Security name applications in the US, from 1879 to 2015. Github Activity — contains all public activity on over 2.8 million public Github repositories. Historical Weather — data from 9000 NOAA weather stations from 1929 to 2016. Wikipedia is a free, online, community-edited encyclopedia. Wikipedia contains an astonishing breadth of knowledge, containing pages on everything from the Ottoman-Habsburg Wars to Leonard Nimoy. As part of Wikipedia’s commitment to advancing knowledge, they offer all of their content for free, and regularly generate dumps of all the articles on the site. Additionally, Wikipedia offers edit history and activity, so you can track how a page on a topic evolves over time, and who contributes to it. You can find the various ways to download the data on the Wikipedia site. You’ll also find scripts to reformat the data in various ways. All images and other media from Wikipedia — all the images and other media files on Wikipedia. Full site dumps — of the content on Wikipedia, in various formats. The data set isn’t too messy — if it is, we’ll spend all of our time cleaning the data. There’s an interesting target column to make predictions for. The other variables have some explanatory power for the target column. There are a few online repositories of data sets that are specifically for machine learning. These data sets are typically cleaned up beforehand, and allow for testing of algorithms very quickly. 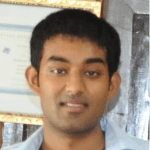 Kaggle is a data science community that hosts machine learning competitions. There are a variety of externally-contributed interesting data sets on the site. Kaggle has both live and historical competitions. You can download data for either, but you have to sign up for Kaggle and accept the terms of service for the competition. You can download data from Kaggle by entering a competition. Each competition has its own associated data set. There are also user-contributed data sets found in the new Kaggle Data sets offering. Satellite Photograph Order — a data set of satellite photos of Earth — the goal is to predict which photos were taken earlier than others. Manufacturing Process Failures — a data set of variables that were measured during the manufacturing process. The goal is to predict faults with the manufacturing. Multiple Choice Questions — a data set of multiple choice questions and the corresponding correct answers. The goal is to predict the answer for any given question. The UCI Machine Learning Repository is one of the oldest sources of data sets on the web. Although the data sets are user-contributed, and thus have varying levels of documentation and cleanliness, the vast majority are clean and ready for machine learning to be applied. UCI is a great first stop when looking for interesting data sets. You can download data directly from the UCI Machine Learning repository, without registration. These data sets tend to be fairly small, and don’t have a lot of nuance, but are good for machine learning. Email spam — contains emails, along with a label of whether or not they’re spam. Wine classification — contains various attributes of 178 different wines. Solar flares — attributes of solar flares, useful for predicting characteristics of flares. 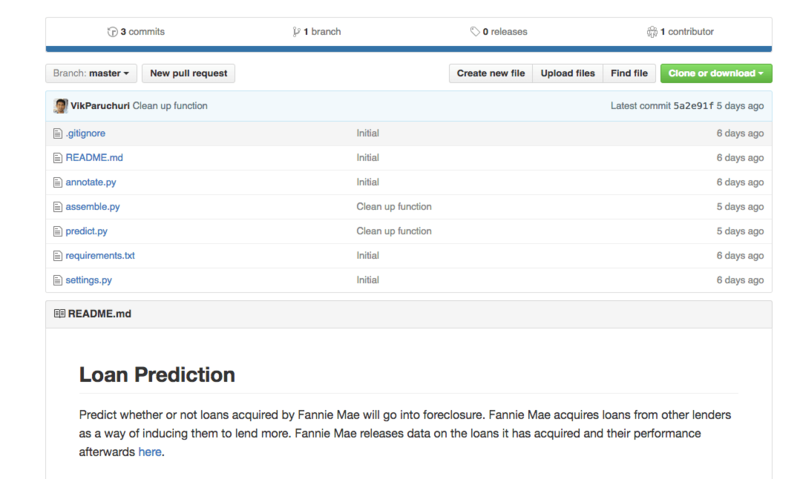 Quandl is a repository of economic and financial data. Some of this information is free, but many data sets require purchase. Quandl is useful for building models to predict economic indicators or stock prices. Due to the large amount of available data sets, it’s possible to build a complex model that uses many data sets to predict values in another. Entrepreneurial activity by race and other factors — contains data from the Kauffman foundation on entrepreneurs in the US. Chinese macroeconomic data — indicators of Chinese economic health. US Federal Reserve data — US economic indicators, from the Federal Reserve. Sometimes, it can be very satisfying to take a data set spread across multiple files, clean them up, condense them into one, and then do some analysis. In data cleaning projects, sometimes it takes hours of research to figure out what each column in the data set means. It may sometimes turn out that the data set you’re analyzing isn’t really suitable for what you’re trying to do, and you’ll need to start over. Be spread over multiple files. Have a lot of nuance, and many possible angles to take. Require a good amount of research to understand. Be as “real-world” as possible. These types of data sets are typically found on aggregators of data sets. These aggregators tend to have data sets from multiple sources, without much curation. Too much curation gives us overly neat data sets that are hard to do extensive cleaning on. data.world describes itself at ‘the social network for data people’, but could be more correctly describe as ‘GitHub for data’. It’s a place where you can search for, copy, analyze, and download data sets. In addition, you can upload your data to data.world and use it to collaborate with others. In a relatively short time it has become one of the ‘go to’ places to acquire data, with lots of user contributed data sets as well as fantastic data sets through data.world’s partnerships with various organizations includeing a large amount of data from the US Federal Government. Data.gov is a relatively new site that’s part of a US effort towards open government. Data.gov makes it possible to download data from multiple US government agencies. Data can range from government budgets to school performance scores. Much of the data requires additional research, and it can sometimes be hard to figure out which data set is the “correct” version. Anyone can download the data, although some data sets require additional hoops to be jumped through, like agreeing to licensing agreements. You can browse the data sets on Data.gov directly, without registering. You can browse by topic area, or search for a specific data set. Food Environment Atlas — contains data on how local food choices affect diet in the US. School system finances — a survey of the finances of school systems in the US. Chronic disease data — data on chronic disease indicators in areas across the US. The World Bank is a global development organization that offers loans and advice to developing countries. The World Bank regularly funds programs in developing countries, then gathers data to monitor the success of these programs. You can browse World Bank data sets directly, without registering. The data sets have many missing values, and sometimes take several clicks to actually get to data. World Development Indicators — contains country level information on development. Educational Statistics — data on education by country. World Bank project costs — data on World Bank projects and their corresponding costs. Reddit, a popular community discussion site, has a section devoted to sharing interesting data sets. It’s called the datasets subreddit, or /r/datasets. The scope of these data sets varies a lot, since they’re all user-submitted, but they tend to be very interesting and nuanced. You can browse the subreddit here. You can also see the most highly upvoted data sets here. All Reddit submissions — contains reddit submissions through 2015. Jeopardy questions — questions and point values from the gameshow Jeopardy. New York City property tax data — data about properties and assessed value in New York City. Academic Torrents is a new site that is geared around sharing the data sets from scientific papers. It’s a newer site, so it’s hard to tell what the most common types of data sets will look like. For now, it has tons of interesting data sets that lack context. You can browse the data sets directly on the site. Since it’s a torrent site, all of the data sets can be immediately downloaded, but you’ll need a Bittorrent client. Deluge is a good free option. Enron emails — a set of many emails from executives at Enron, a company that famously went bankrupt. Student learning factors — a set of factors that measure and influence student learning. News articles — contains news article attributes and a target variable. It’s very common when you’re building a data science project to download a data set and then process it. However, as online services generate more and more data, an increasing amount is generated in real-time, and not available in data set form. Some examples of this include data on tweets from Twitter, and stock price data. There aren’t many good sources to acquire this kind of data, but we’ll list a few in case you want to try your hand at a streaming data project. Twitter has a good streaming API, and makes it relatively straightforward to filter and stream tweets. You can get started here. There are tons of options here — you could figure out what states are the happiest, or which countries use the most complex language. We also recently wrote an article to get you started with the Twitter API here. Github has an API that allows you to access repository activity and code. You can get started with the API here. The options are endless — you could build a system to automatically score code quality, or figure out how code evolves over time in large projects. Quantopian is a site where you can develop, test, and operationalize stock trading algorithms. In order to help you do that, they give you access to free minute by minute stock price data. You could build a stock price prediction algorithm. Wunderground has an API for weather forecasts that free up to 500 API calls per day. You could use these calls to build up a set of historical weather data, and make predictions about the weather tomorrow. 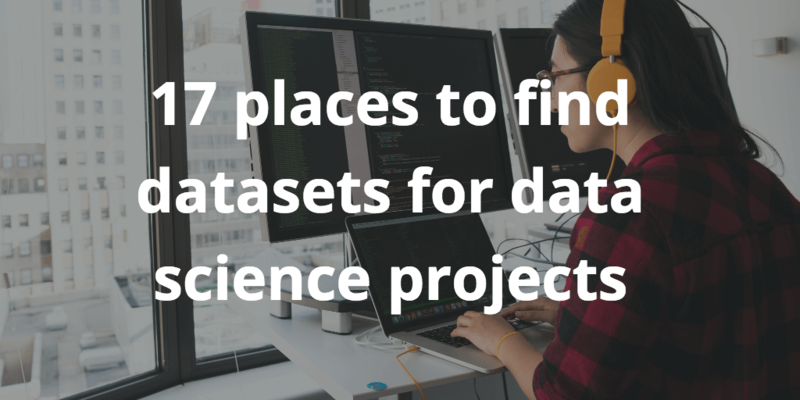 In this post, we covered good places to find data sets for any type of data science project. We hope that you find something interesting that you want to sink your teeth into! If you do end up building a project, we’d love to hear about it. Please let us know!